Courtesy of Southwest AirlinesA Southwest aeroplane takes off. A Southwest flight was forced to make an emergency landing in Albuquerque after a man reportedly tried to touch a female passenger against her will and yelled at the flight crew. A filing with the district court in Albuquerque said that Justin Riley Brafford touched her leg and tried to play “footsie” with her, and followed her when she moved seat. He then went from “zero to sixty in nano-seconds,” the filing said, and yelled at a flight attendant. The pilot then made an emergency landing, and Brafford remains in federal custody in New Mexico. A Southwest flight made an emergency landing on Tuesday after a man reportedly wouldn’t stop touching a female passenger against her will and yelled at the crew after she was moved seats. The man, identified as Justin Riley Brafford, 29, played an unwanted game of “footsie” with the female passenger next to him and put his arm on her leg as flight 859 readied for takeoff, the Dallas Morning News reported, citing a criminal complaint filed in US District Court in Albuquerque. The crew moved the woman, but Brafford tried to bring her a drink, the complaint said. A flight attendant spoke to him, causing him to go from “zero to sixty in nano-seconds” and starting to yell at the flight attendant, according to the filing. 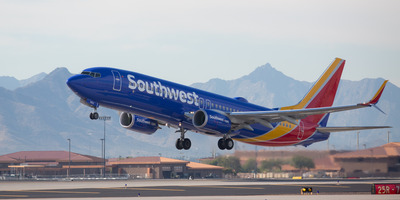 A Southwest spokesperson told Business Insider: “The Captain of Flight 859 on Tuesday from Los Angeles to Dallas elected to divert to Albuquerque where local law enforcement met the aircraft following reports of an unruly Customer. Once the Customer was removed, the flight continued to Dallas Love Field. Brafford allegedly told authorities that he and the woman were watching videos on her computer and he believed she was flirting with him. The Morning News reported that he admitted to using methamphetamines the day before the flight and overdosing on heroin Saturday. Brafford, 29, is in federal custody in New Mexico and faces felony interference with a flight crew and a misdemeanour assault charge, according to the newspaper. He faces up to 20 years in federal prison and a $US250,000 fine.